The Trust’s learning manager Chloe Willis blogs about Wiseradviser’s new resource to help debt advisers supporting clients in vulnerable circumstances. We are always exploring ways that new technology can support us in our work at the Trust, and years of experience tells us that sometimes the simplest things can be the most effective in helping people in need of advice. This is true for those who deliver it too.  With that in mind, we’re pleased that Wiseradviser is today launching a new resource to support debt advisers in their work with vulnerable people. Two sets of visually-striking cards that bring together useful phrases, tips and behaviours, demonstrated by clear examples, will support advisers to identify, and respond to, vulnerability during advice sessions. Of course, money and debt advisers are already supporting clients in vulnerable situations every day – but that doesn’t mean that it’s easy to do so. Advisers often face anxiousness or reluctance from people to share their personal information, or people may have unique needs that can make the situation challenging. These cards can be a useful prompt when advisers find themselves in this position. Last June the Trust launched ‘Vulnerability: a guide for advice agencies – 12 steps for treating clients in vulnerable situations fairly’, with the support of many organisations across the sector. We wanted to help advisers to feel more confident discussing and recording sensitive information – we understood advisers didn’t always feel comfortable asking questions around vulnerability and how it affected a client’s financial situation, or would be taken into account. In addition to this guide, Wiseradviser also developed e-learning and a face-to-face workshop on vulnerability. 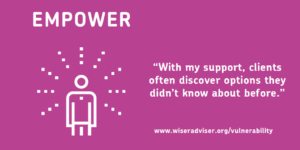 In our 2016 evaluation of Wiseradviser training, our courses on ‘Vulnerability’ and ‘Debt and Mental Health’ were among those that advisers told us had the biggest positive impact on clients. We hope that these cards will be another tool in achieving this aim. We would like to thank AdviceUK, Citizens Advice, Money Advice Scotland, Toynbee Hall, The Institute of Money Advisers, StepChange, the Money Advice Service, Christians Against Poverty, The Financial Ombudsman Service, Chris Fitch and Colin Trend, for their support and feedback in the development of these cards. The cards can be accessed online and printed. They will also be available at the Trust’s stand at the IMA conference today and tomorrow (Monday 15th and Tuesday 16th May).